Interaction Flow Modeling Language describes how to apply model-driven techniques to the problem of designing the front end of software applications, i.e., the user interaction. The book introduces the reader to the novel OMG standard Interaction Flow Modeling Language (IFML). 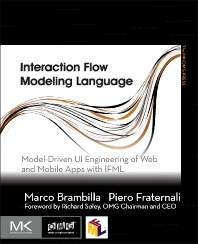 Authors Marco Brambilla and Piero Fraternali are authors of the IFML standard and wrote this book to explain the main concepts of the language. They effectively illustrate how IFML can be applied in practice to the specification and implementation of complex web and mobile applications, featuring rich interactive interfaces, both browser based and native, client side components and widgets, and connections to data sources, business logic components and services. Interaction Flow Modeling Language provides you with unique insight into the benefits of engineering web and mobile applications with an agile model driven approach. Concepts are explained through intuitive examples, drawn from real-world applications. The authors accompany you in the voyage from visual specifications of requirements to design and code production. The book distills more than twenty years of practice and provides a mix of methodological principles and concrete and immediately applicable techniques. Marco Brambilla is actively researching on methods and tools for model-driven software development, with special focus on web applications, search engines, social networks and crowdsourcing platforms. He is professor of software engineering and researcher at Politecnico di Milano and partner of the spinoff WebRatio, which produces MDD tools based on IFML, UML, and BPMN. He is the principal contributor of the Interaction Flow Modeling Language (IFML). He authored several books, including Developing Data-Intensive Web Applications (Morgan Kaufmann, 2002) and Model-driven Software Engineering in Practice (Morgan&Claypool, 2012). Piero Fraternali has researched for twenty years on the methods and tools for improving the development of Web and multi-channel applications. He is the principal investigator of the Web Modeling Language (WebML), which inspired the IFML OMG standard, and co-founder of WebRatio, a company specialized in model-driven tools.